July 28 is World Hepatitis Day (WHD), one of eight official global public health campaigns marked by the World Health Organization (WHO). WHD aims to raise global awareness of hepatitis and encourage prevention, diagnosis and treatment. Viral hepatitis – a group of infectious diseases known as hepatitis A, B, C, D, and E – affects hundreds of millions of people worldwide, causing acute and chronic disease and killing close to 1.4 million people every year. The year 2016 is particularly important in the global fight to eliminate hepatitis. Earlier this year, on 28 May, 194 WHO Member States made a historic commitment to eliminate viral hepatitis by 2030. During the 69th World Health Assembly, governments unanimously voted to adopt the first ever Global Viral Hepatitis Strategy, signalling the greatest global commitment in viral hepatitis to date. The strategy sets a goal of eliminating hepatitis B and C by 2030 and includes a set of prevention and treatment targets which, if reached, will reduce annual deaths by 65% and increase treatment to 80%, saving 7.1 million lives globally by 2030. Furthermore, as part of the commitments made during at the 69th World Health Assembly, Nohep, a global movement to eliminate viral hepatitis, is being launched on 28 July to bring people together and provide a platform for people to speak out, be engaged, and take action to ensure global commitments are met and viral hepatitis is eliminated by 2030. Hepatitis, which is an inflammation of the liver, can be self-limiting or can progress to fibrosis (scarring), cirrhosis or liver cancer. Although hepatitis viruses are the most common cause of hepatitis, other infections, toxic substances (such as alcohol and certain drugs), and autoimmune diseases can also cause hepatitis. Globally, viral hepatitis affects approximately 400 million people, with 6-10 million newly infected annually. While hepatitis is a global problem, sub-Saharan Africa is particularly burdened. For example, hepatitis B prevalence is highest in sub-Saharan Africa and East Asia, where between 5-10% of the adult population is chronically infected, while with a prevalence of between 5-8% and an estimated 32 million people infected with the hepatitis C virus (HCV), sub-Saharan Africa has the highest burden of the disease in the world (Karoney and Siika 2013; Schweitzer et al. 2015). Moreover, sub-Saharan Africa has a high prevalence for the other viruses as well due to generally poor sanitary conditions and hygienic practices, lack of access to safe water, and poor awareness and education. Eritrea’s efforts to combat hepatitis have involved a multidimensional, cost-effective, pragmatic approach and broad participation. A range of general public health and development initiatives that have been undertaken have helped to combat the prevalence and spread of hepatitis in the country. These include: sexual health education; widespread advocacy and awareness campaigns; the provision of condoms, the expansion of access to basic sanitation and safe, clean water, particularly in rural areas; improved disposal of sewage within communities; and harm reduction programs. Another vital step has been immunization and vaccination which, according to the WHO, is, “the most effective and cost-saving means of prevention.” For many years in Eritrea, immunization and vaccination programs have been conducted through an array of cooperative agreements with various international organizations and partners, including the United Nations Development Programme (UNDP), UNICEF, the WHO, and the GAVI Alliance. These partnerships have increased important supplies such as vaccines, syringes, and other materials, while strengthening support for the development, production, and dissemination of social mobilization materials, regional plans, and logistics. In 2002, Eritrea introduced childhood immunization against hepatitis B as part of the Ministry of Health’s Expanded Program on Immunization, which also delivers immunization for children against seven other vaccine preventable diseases (i.e. Tuberculosis, Diphtheria, Whooping Cough, Tetanus, Polio, Measles and Homophiles influenza type B). 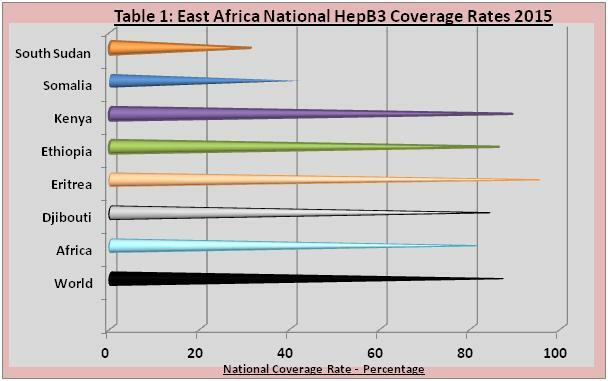 According to recently updated data from the WHO and UNICEF, national HepB3 coverage (measuring the number of third doses of Hep-B vaccine administered to infants) in Eritrea is approximately 95%. By comparison, the global average national coverage rate is 87%, while the average for Africa is 81%. In terms of Eritrea’s neighbours, national coverage rates are as follows: Djibouti 84%; Ethiopia 86%; Kenya 89%; Somalia 42%; South Sudan 31%; Sudan 93%, and Uganda 78%. Hepatitis B vaccination programs are particularly important because they gradually result in the reduction of HBV-related chronic hepatitis, liver cirrhosis and hepatocellular cancer. 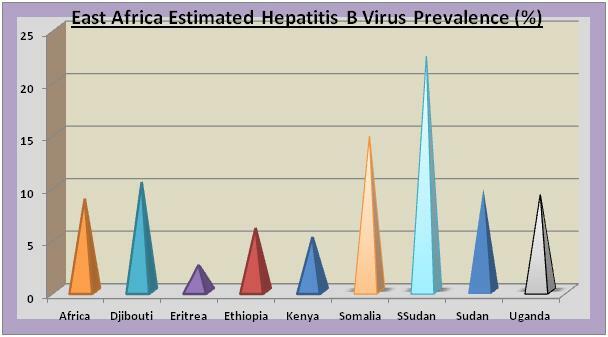 Ultimately, Eritrea’s vaccination programs have played an important role in reducing the prevalence and spread of hepatitis, and recent research studies estimate that the country’s prevalence of hepatitis B is approximately 2.49%, the lowest in Africa (Schweitzer et al. 2015). Overall, Eritrea’s multifaceted efforts have had a positive impact in combating and controlling hepatitis. With renewed commitment, effective immunization, vaccination, and prevention programs, an expansion of treatment and health services, as well as continued support from international partners, Eritrea can move towards eliminating viral hepatitis and continue to protect and improve the health and development of its greatest asset – its men, women, and children.